"Dare you to do Daytona Beach, it's the Vacation Outside the Lines." Daytona Beach, Florida is famous for its racing, cars, motorcycles, boats and don’t forget the spring breaks and bike week. It over shadows its hard pristine beaches, but Daytona has another secret…a variety of fishing! From Freshwater to Saltwater: Inshore, Offshore or Bass Fishing, iOutdoor Fishing Charters have you covered. You can reach Daytona Beach Fishing within a 25 mile radius of your destination. Our Inshore Fishing, Offshore Fishing and Freshwater Largemouth Bass Fishing Charters can provide a unique Florida Fishing experience. 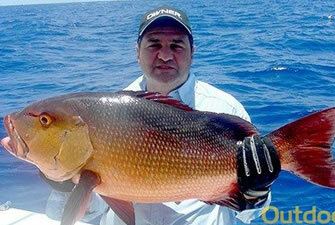 iOutdoor offers offshore fishing for Trophy Sailfish, Mahi-Mahi, Kingfish, Red Snapper, Grouper, Sharks and More. Discover what Inshore Daytona Beach Fishing can offer you while chasing down Famous Redfish, Snook, Tarpon and great tasting Sea Trout. 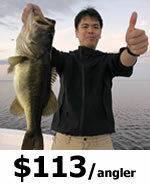 Daytona Beach Fishing for Trophy Largemouth Bass is just minutes away from the Daytona International Speedway on the World Famous St. Johns River. Land yourself a tasty freshwater Crappie or Speck as well on this fishing trip. If you are looking for the ultimate fishing adventure, get hooked up on a iOutdoor Fishing Charter perfect for the whole family and friends! Our Inshore Fishing, Offshore Fishing and Freshwater Largemouth Bass Fishing Charters can provide a unique Florida Fishing experience. iOutdoor offers offshore fishing for Trophy Sailfish, Mahi-Mahi, Kingfish, Wahoo, Red Snapper, Grouper, Sharks and More. Discover what Inshore Daytona Beach Fishing can offer you while chasing down Famous Redfish, Snook, Tarpon and great tasting Sea Trout. 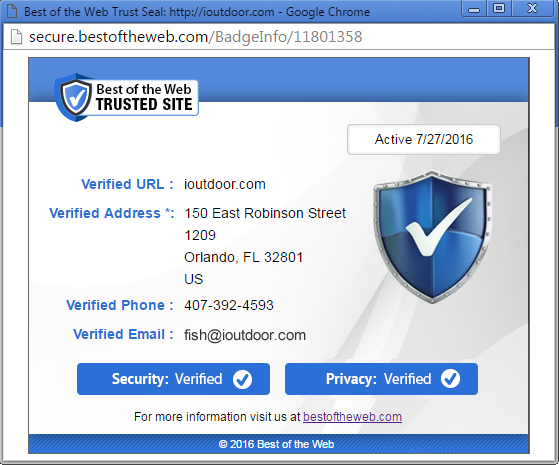 Search iOutdoor, Compare & Book the Best Daytona Beach Fishing Charters Today. Captain Steve is the best! Daytona Beach waters are getting colder this month. The best fishing is for inshore species including Redfish, Black Drum, Trout, and Sheepshead. 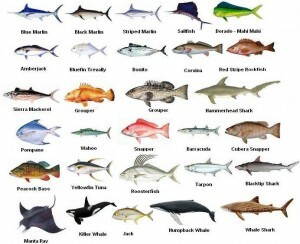 If you adventure offshore, enjoy catches of Sailfish, Tuna and Snapper and Grouper on the Bottom! Welcome to the month where the Largemouth Bass Spawn starts once the water temperature is right! This is the month of the Kingfish Migration. You can fins them all over Daytona Beach. Get your lines wet and the smokers ready! Enjoy catches of Tuna, Snapper Wahoo and Grouper as well. Inshore fishing is still HOT! Largemouth Bass fishing is exceptional this month as well in the surrounding freshwater systems. Spring is right around the corner and temperatures start to get warmer. Bait fish including finger mullet start to move in and all the species begin to feed. Enjoy catches of Mahi-Mahi, Sailfish, Amberjack, Wahoo, Kingfish and many more! April brings around FANTASTIC fishing for Cobia. The spring migration of Manta Rays always draws Cobia with them. 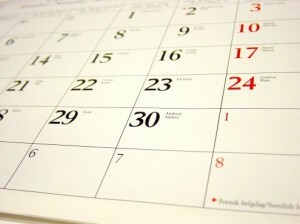 May is one of the BEST months for fishing here in Daytona Beach. Everything starts to come alive. Inshore fishing consist of Redfish, Trout, and Snook. Enjoy also catching Wahoo, Cobia, Sailfish, Mahi-Mahi and potentially a Marlin! It is summer time in Daytona. Rain showers and warm weather is destined. Enjoy a shorter fishing charter for Cobia, Spanish Mackerel, Mahi-Mahi, and even the mighty shark. 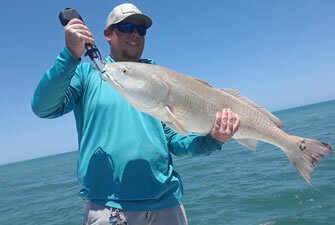 Also, enjoy the search for a BULL redfish on an inshore charter. Reefs and Wrecks are bustling with activity during the warmest month of the year. Bait and fish are looking for cooler water. Enjoy catches from Snapper, Grouper, Mahi-Mahi, Spanish Mackerel, Redfish and more! The best fishing this month is for Tarpon. The warm waters draw the tarpon chasing bait and enjoying every catch! Get hooked up on an inshore fishing charter. October is a great month for offshore fishing as weather begins to cool. Mahi-Mahi and Kingfish are on the prowl. If you are looking for bait, Bonito is strong. Sailfish can also be caught. Largemouth bass are starting to feed strong with the change in weather! Bass are gearing up for the spawn, eating anything in sight. Great time to land some nice fish. November is a great time to spend long days on the water. Kingfish, Wahoo, and Sailfish provide a strong bite! Looking for a larger fish? 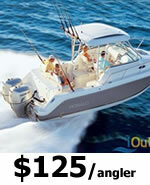 Go out of a full day of fishing whether inshore or offshore. 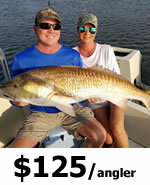 Inshore enjoy catching Redfish, Black Drum and Sheepshead. 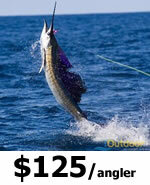 Offshore can lead you to catches of Sailfish, Kingfish, and many more! Call us at +1 (888) 412-1117 and let’s start planning your Daytona Beach Florida Fishing charters! 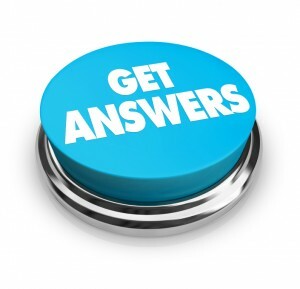 For additional Daytona Beach information be sure to go to Visit Daytona Beach.